There are some awesome gifts to give and get this holiday season. Whether you gift yourself or your family and friends, you have lots to chose from. Polaroid’s Z340 replaced our earlier POGO Polaroid Camera and what an improvement! We had so much fun snapping pix with this little gem and then the pictures are saved digitally so we could reprint them or upload them later. No ink cartridges to buy. 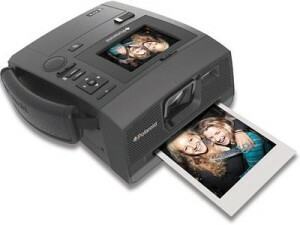 The Polaroid Z340 Instant Digital Camera features a 14.0 megapixel sensor to snap, print and share. No computer connections are needed to get 3×4″ smudge-proof, water-resistant, tear-resistant, full-color prints. You can even view, crop and edit pictures before you print thanks to the bright 2.7″ color LCD on the top of the camera. Add a fun and useful border to your photo including the Polaroid Classic Border Logo format or upload custom borders. . Print up to 25 photos per full battery charge with the option to print date and file numbers. The paper uses the zero ink technology and is less expensive than earlier Polaroid film products. This is a win win gift to give or receive. Stay tuned for more highlights from our gift and give segments this month.